Almost 50,000 people are expected at the annual Cleveland Asian Festival (CAF) this weekend—offering great exposure to growing small businesses that operate a booth during the two-day celebration of Cleveland and everything AsiaTown has to offer. 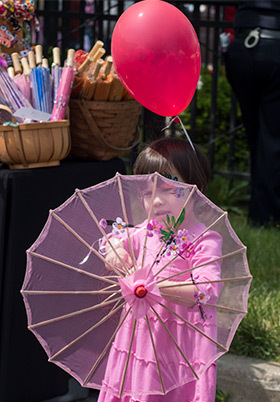 Slated for this Saturday (May 19) and Sunday (May 20), the event will showcase the best of Asian food and culture offered in the neighborhood around E. 27th Street and Payne Avenue. Shopping will be available at the Asian Food Court, Food Truck Lane, and World Marketplace. Other highlights will include martial arts demonstrations, Lolly the Trolley neighborhood tours, nationally-known musicians Larissa Lam and Only Won, and even an egg roll eating contest. Numerous restaurants have opened after having a booth at the Asian Festival, including Himalayan Restaurant Nepali and Indian Cuisine (which opened on Lorain Ave. in November 2017). “[The owners] said it really helped that people tried their food at the festival before they opened,” says Wong. The owners of Miega Korean BBQ at Asian Town Center on E. 38th Street also got their start at the festival by organizing the food booth for the Korean American Association of Greater Cleveland (KAAGC) in 2010. And, according to Wong, Banh Mi & Noodles will soon open at Asian Town Center, having cultivated a following at the CAF for the past few years. 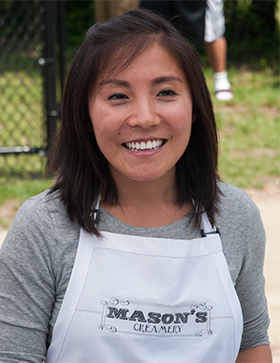 Helen Qin of Mason’s CreameryJesse Mason and Helen Qin started their ice cream business, Mason’s Creamery, in 2013 at the CAF and now operate a thriving shop in Ohio City. Qin remembers being nervous when officials told her they would be debuting their ice cream to between 20,000 and 30,000 people at the festival, but she says the processes they learned at their first-ever event are still in place today. Because so many businesses have thrived after participating in the CAF, the all-volunteer planning committee decided to host a “Pop-Up Competition” this year to not only encourage the entrepreneurial spirit of the festival, but to encourage small business owners to consider AsiaTown as a location to open a physical presence. African fashion retailer Chimu designHuang says they received many applications for the contests, with the aim of selecting a business that had a good proof of concept and needed a broader audience to further test its model. Ultimately, they decided on Chioma Onukwuire, founder of African fashion retailer Chimu. Wong says there are a variety of new businesses—both food and retail—at the CAF this year, as well as the addition of food trucks and the return of some old favorites. “You can be at the festival for all of the two days and still not see and try everything,” she promises. Free parking will be available at E.24th Street and Payne Avenue, with a free shuttle to transport guests to the activity. The Cleveland Asian Festival runs from 11 a.m. to 7 p.m. both Saturday and Sunday.